Before redoing the website I was not really sure what she was trying to accomplish - blog promotion or booking speaking gigs. I had the pleasure of meeting Jodi at a conference where she signed up for a 1 0 minute meeting with me to do a website evaluation. When I looked at her website, it looked like she was a blogger. There was no call to action - no mention of her skills or talents and no indication that she was so much more than a blogger! We connected - and today we are excited that she know has a website that really brings light to what she does and why she should be at industry conferences to speak about an important topic, End of Life Planning. 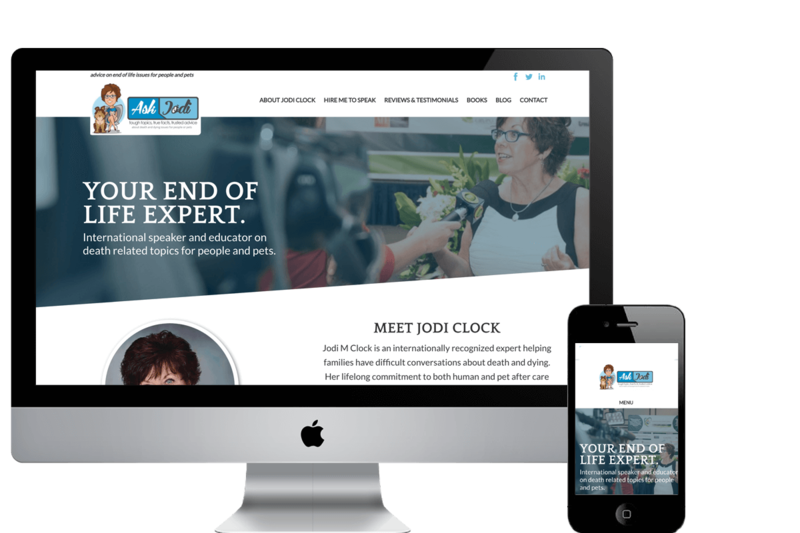 After migrating all of her content off of Wordpress.com and implementing a new fresh look that clearly defines her area of expertise and showcases exactly what she wants visitors to know about her, Jodi now has a website that can book more business and speaking engagements while still creating articles that can help more people. Her whimsical logo required just a little element of uniqueness within the website layout so we utilized an angled look to just dress it up and large personal images to engage visitors. That is the words used to describe how Jodi has it in regards to updating the website. Simple fields that she just fills in or edits make it super easy to update and maintain. No editors, no CSS no HTML - just enter the data and voila - it goes where it needs to and looks the way it should on the page! Below is how jodiclock.com looked before our redesign. 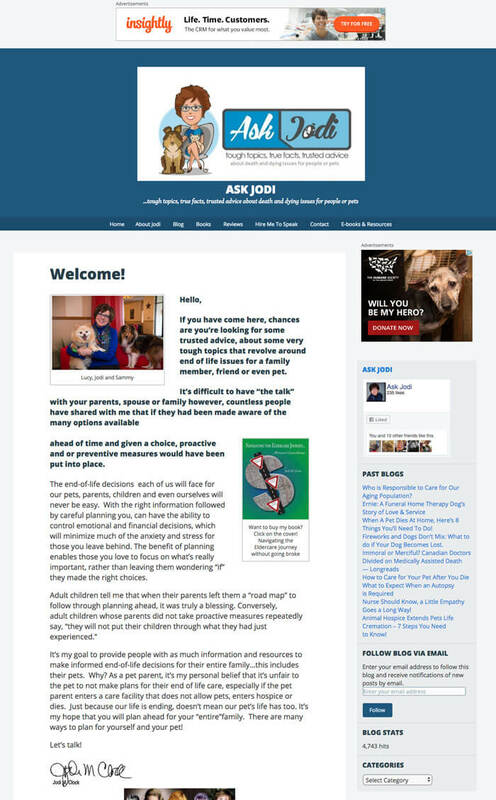 You can see the layout was a traditional blog format and did not educate visitors on what Jodi offers and how she can help them in a clear way. Too much content can overwhelm readers and the lack of focus or direction can leave potential clients confused.